Billionaire investor and Democratic activist Tom Steyer speaks during a news conference where he announced his decision not to seek the 2020 Democratic presidential nomination, Wednesday, Jan. 9, 2019, at the Statehouse in Des Moines, Iowa. The more the merrier in the presidential race should be the general rule for a party not in power and eager to reclaim the White House after multiple years in the wilderness. However, I draw the line at self-absorbed billionaires with no governing experience who throw their money around on vanity projects. I’m not talking about President Donald Trump, for now, but progressive moneyman Tom Steyer. The New York Times reports: “Tom Steyer, the California billionaire who has crusaded for President Trump’s impeachment, said on Wednesday that he would not join the pack of Democrats running for president in 2020.” Instead, he will continue running those impeachment ads. 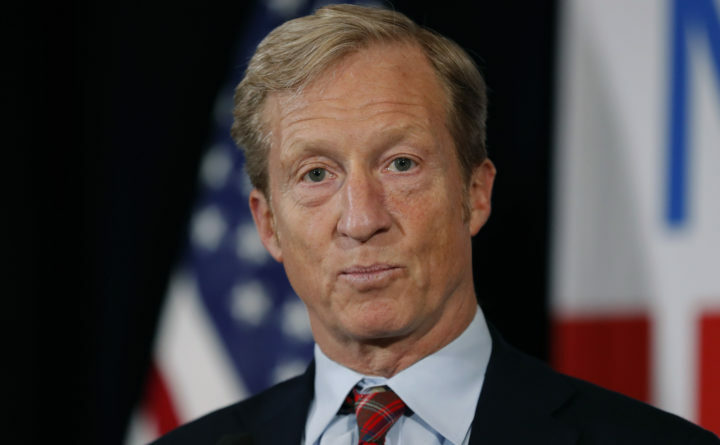 “Underwritten by Mr. Steyer’s personal wealth,” the Times report continued, “the impeachment campaign has bombarded television and computer screens around the country with ads demanding Mr. Trump’s ouster, and staged pro-impeachment events around the country.” He’s spent tens of millions of dollars already and plans to spend $40 million more. I don’t share Democratic Sen. Elizabeth Warren’s aversion to self-funded candidates. A candidate such as former New York City mayor Michael Bloomberg would add a lot to the 2020 race, has well-thought out positions on important issues and would be qualified to serve as president. However, I certainly do object to unqualified dilettantes taking up space and political oxygen. (In fact, put me down as against any presidential candidate who has zero military or civilian service.) Steyer’s decision not to run therefore is good for the country and the Democratic Party. It is also far from certain that he would have won many votes. However, it is ridiculous, deplorable even, for him to spend tens of millions of dollars on an utterly useless campaign to impeach Trump, regardless of whether you favor impeachment. Trump either will or won’t be impeached after the report from special counsel Robert Mueller is completed; lawmakers and the public won’t be influenced by Steyer’s annoying, ubiquitous ads — featuring himself! — but by what’s in the report, Trump’s political standing and the reaction of voters. Steyer’s financial wastefulness is his own concern, I guess, but the moral vacuity of spending money on such an ostentatious activity is matched only by Arab sheikhs eating gold. (Really, that’s a thing now.) Imagine the children who could be educated, the families fed, the shelter and mental health services provided to the homeless, the diseases eradicated, the species saved and the mentors hired for $40 million dollars. Oh, and I have one question for the environmentalist mogul: Why did he add to his carbon footprint by flying to Iowa to announce he wasn’t running for president? Jennifer Rubin writes reported opinion for The Washington Post. Follow her @JRubinBlogger.